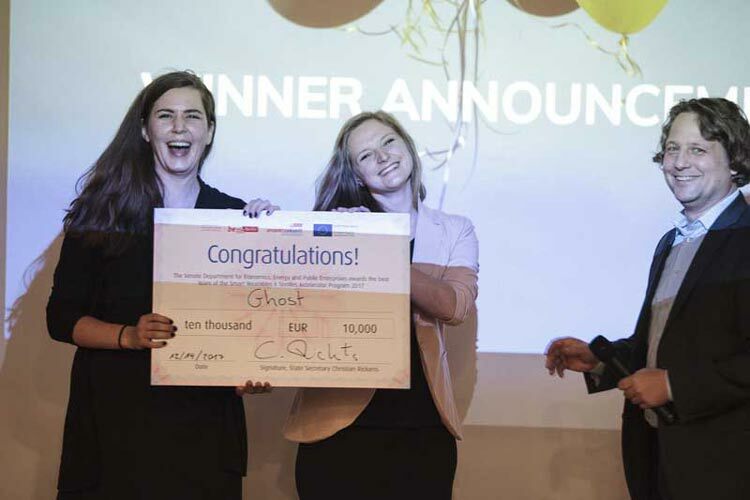 On the 14th of December 2017, the startup Ghost was chuffed about winning the “Smart Wearables x Smart Textiles”-Award, which also comes with 10.000 euros and was initiated by the Senate Department for Economics, Energy and Public Enterprises. The visionary idea, which led its founders Laura Bücheler and Isabella Hillmer to the success: a prosthesis, that is supposed to give back people, that are affected by nerve damages or an amputated arm, a sense of temperature. Laura Bücheler already works in biomedicine and Isabella Hillmer is experienced in psychology and industrial design. Their invention could make expensive and complicated surgery redundant. Before the two winners were chosen by the jury of experts, consisting of Thomas Andrae (Linden Capital), Olaf Bender (DIN), Tim Dümichen (KPMG), Alexander Kölpin (WestTech Ventures), Tanja Mühlhans (SenWEB), Bettine Schmitz (AS Plug & Play) and Stephan Schulze (IBB), the four finalists passed an accelerator-programme until November 2017, where the teams or startups could work on their ideas and get them ready for the market. Smarterials constructed a surgery glove made of two-layered material, which doesn’t affect the wearer’s tactile sensation, but at the same time provides more needed protection. The smart glasses by AiServe helps visually impaired people orientate with voice control and automatic image recognition in their daily life. Admittedly only one team was able to win the award, four young startups formed a foundation for a successful business future and are responsible for innovations in the digitalised medical-area.